Capture texts and tables without retyping. Create “snapshots” of images and text from opened documents, file menus, Web pages, presentations, Flash-content, or PDF files with a few clicks. 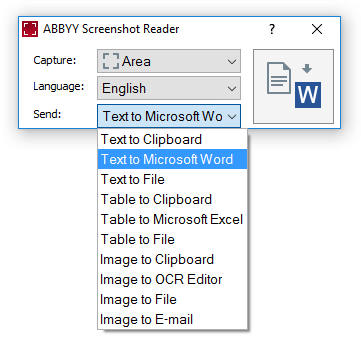 ABBYY Screenshot Reader turns text within any image captured from your screen into an editable format without retyping – making it easy to reuse in digital documents, emails or reports. It accommodates more than 180 languages with outstanding recognition accuracy. The program’s main screen allows to choose an area for the screenshot and an output format. Screenshot Reader can be set up to launch automatically at each start up and will be always by your hand. 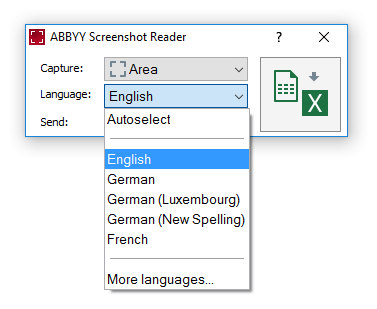 ABBYY Screenshot Reader lets you save image screenshots in JPEG, Bitmap or PNG formats. Text screenshots can be saved as editable texts in .RTF, .TXT, .DOC or .XLS formats. Powered by award winning ABBYY OCR (Optical Character Recognition) technology that turns paper documents and images into editable electronic formats with superior accuracy. Capture an interesting part of the screen and save it as an image or share with your friends. Just mark certain part of the screen with ABBYY Screenshot Reader and send it as image by e-mail or by messenger or store it on your computer. Prepare small – size images for your presentations, reports and other documents. Open the image, create the screenshot, copy it to the clipboard and then insert into the document with CTRL+V keys or “paste” functions. If you want to grab some text from an image file, Web site, presentation, or PDF you can quickly turn text areas into truly editable text that you can paste directly into an open application, edit or save as Microsoft® Word or Excel® documents. Extract text from brochures and leaflets that are only available as graphics: select a piece of text and it will automatically open as editable information in Microsoft Word. Transform image tables into editable Excel worksheets. You are booking a room at a hotel or are going to a corporate event, but some of the arrival directions are only in flash and the other are sent in a separate e-mail. With Screenshot Reader, you can easily add all the necessary driving information into a Word document and then print it on single piece of paper. You need to explain a problem with your PC? Simply capture program’s messages and dialogues or system information and send it to the technical support by e-mail together with the explanations of the problem. It is a lot easier than remembering: “there is a problem with the .batix./320.dir file”. Identify and manage company’s commitments across numerous paper and digital contracts and leases. Learning foreign language and need to gather the words you study from a website into an Excel file? Let Screenshot Reader do the job, instead of manually cutting and pasting each word. Ready to try Screenshot Reader?